Grosse Pointe Music Academy is located on Mack Avenue, a half mile north of Moross, next to Papa Romano’s and Men’s Warehouse in Grosse Pointe Woods. We are a short commute from Detroit, Harper Woods, St. Clair Shores, Eastpointe, Roseville, Grosse Pointe, Grosse Pointe Farms, Grosse Pointe Woods, and Grosse Pointe Shores. Since opening in 2005 on Charlevoix Street in the Park, we have grown to over 800 students studying in private guitar lessons, private piano lessons, private violin lessons, private drum lessons, private voice lessons, guitar ensemble classes, rock band classes, and Music Together. Our range of music classes and instructors makes it possible for anyone regardless of age or experience will find a class suitable to their needs. Private lessons students can study music of various styles including classical, rock and roll, blues, jazz, country, heavy-metal, and other contemporary styles. All of our teachers work well with beginning students of all instruments. Advanced students will find that we have an array of music instructors who specialize a wide range of styles. 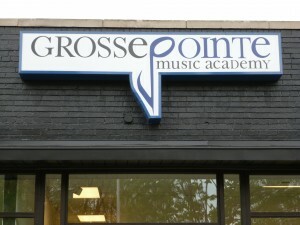 Grosse Pointe Music Academy is very active in the Grosse Pointe Communities and bordering communities. We have donated lessons and items to local auctions annually at the Grosse Pointe Academy, St. Clare of Montefalco, St. Paul, Christ Church, Assumption in St. Clair Shores, Maire Elementary, Defer Elementary, and many other schools and institutions. We believe in supporting and helping all of our city’s institutions and business flourish. In the summer of 2011 we became a sponsor for the Music on The Plaza events. Our twice yearly music recitals are free of charge use it as an opportunity to collect food for a local food bank. Grosse Pointe Music Academy’s rock band program has become a great outlet for many young and old musicians who want to learn the skills necessary to play together as a group. Many of our groups are routinely performing at community events and charities. Rock Band class isn’t just for rock music. Rock band is the popular title for a group class of performing musicians. We can arrange for any style of group ensemble for students with particular interests. Many students are interested in blues bands, jazz bands, and other improvisational groups. Rock band class is just as much for adults. This class will help you go from “jamming” to “gigging” in no time. You’re never too old to do something you always wanted to do!